What an exciting year 2016 has been at the hangar. We launched our ambitious revitalization project, which will eventually see every aircraft displayed in its proper context. We added new staff, revamped our administrative offices and are on our way to becoming a more professional organization. We are rebuilding ties with the City of Edmonton and with other groups in the city. We also launched a successful lecture series and are reaching more people than ever before with our monthly newsletter. The coming year looks just as bright as we continue to grow into a modern, relevant and inviting museum. We could have not have done it without our dedicated staff and our scores of devoted volunteers. We thank each and every one of you and wish you all a happy holiday season. A reminder that memberships expire at the end of December. Annual fees are: Individual $60, Volunteer $35 and Family $115. If you are not yet a member, consider joining. Better yet, volunteer. 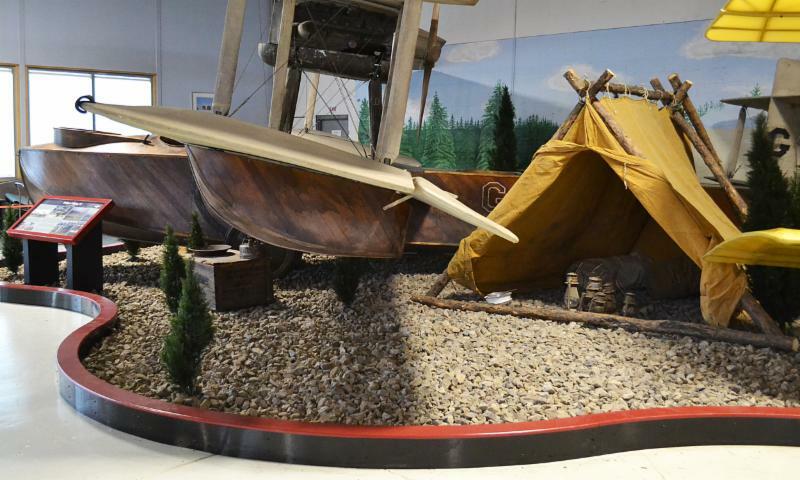 You will not only get your membership for nearly half price, you will help us build a world-class museum to better tell Edmonton's rich aviation history. 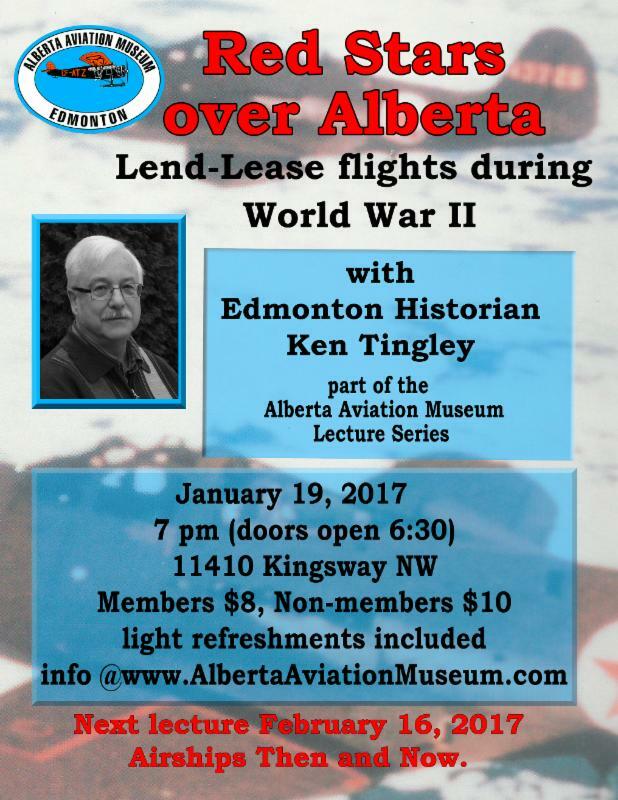 For more information, call 780-451-1175 or info@albertaaviationmuseum.com. Note: Due to the holiday, the next issue of From the Hangar will be published Feb 1, 2017. It's been quite a while since we embarked on a major aircraft restoration project at the museum and our volunteers have been itching to rebuild something. There was some concern about the future of the present restoration area due to the furnace replacement, but the board decided it was a valuable part of the museum. So we are moving ahead with our first new project, a ground-up restoration of a Bell 206A Jet Ranger. "It was basically a wreck that was written off and used as a NAIT training aid," says museum librarian John Liddle, who is project manager for the Bell. "It previously had flown but it looks like if suffered a lot of structural damage on a hard landing." 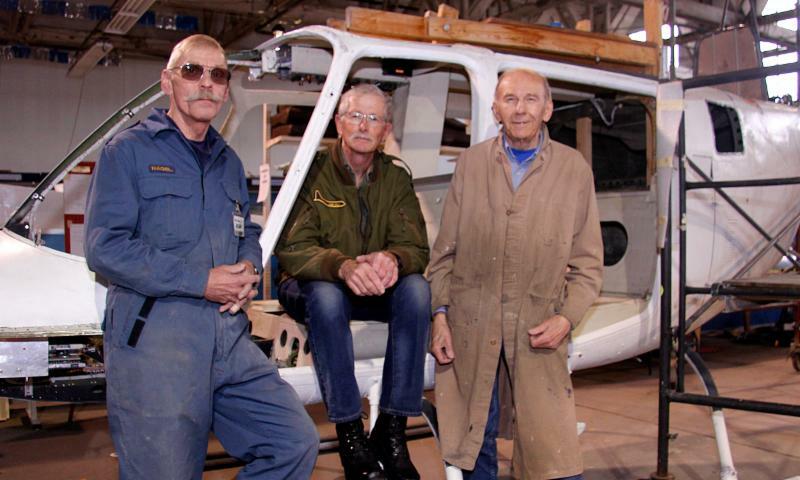 The helicopter is being restored in RCMP colours as part of a display that will pay tribute to the 70 years the Mounties had aircraft based in Edmonton, most of the time at Blatchford Field. It's a bit of 'deja-vu' for Harry Nagel, one of the volunteer restoration crew. He worked on the same kind of helicopters in the military with 408 Squadron. "In the military this one would have been known as a [Bell CH-136] Kiowa and used as a light observation helicopter," says Nagel. "It's great because this thing isn't older than I am. The last aircraft I worked on was older than me. So that's good." Also working on the project are aircraft sheet metal 'guru' Don Hitsman and long-time volunteer Wally Ostafichuk. Completion is expected to take about a year. We'll bring you more details as it progresses. Volunteers Harry Nagel, John Liddle and Wally Ostafichuk. 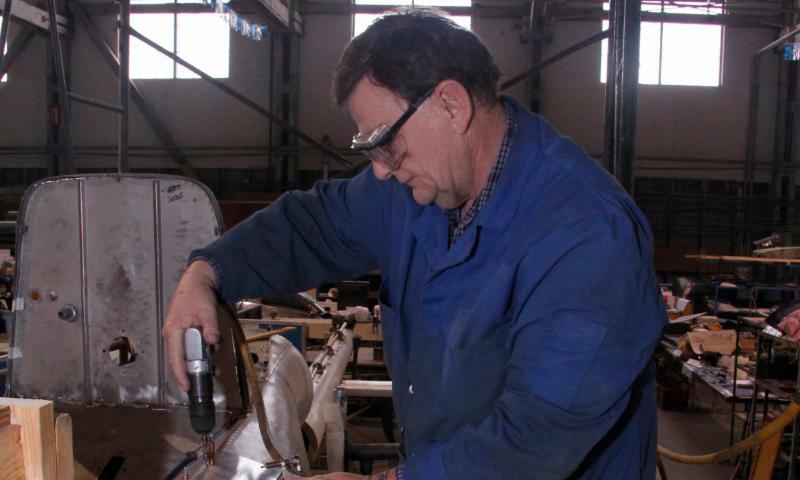 Don Hitsman drills out a hole in preparation for riveting. We lost two members of our aviation museum community in recent months. 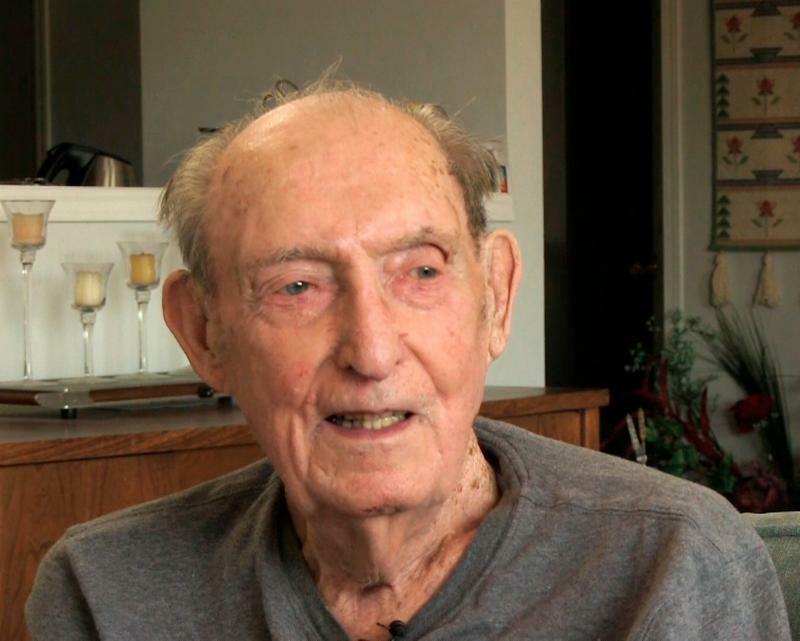 Owen Cornish, a World War II bomber pilot, who also flew after the war, died on Remembrance Day at the age of 94. Tony Allinson, a post-war military aircraft mechanic, who went on to a long and distinguished career as an accident investigator, also died in November. He was 77. Cornish spent more than two decades as a military aviator. He was a flight instructor and Halifax bomber pilot during World War II, completing 24 missions. Then he returned to Edmonton, where he became a prominent dentist and continued to fly part-time with 418 (City of Edmonton) Squadron. Cornish rose to the rank of Commanding Officer and Wing Commander before his retirement in 1961. But to many of his friends in 418 Squadron, Cornish will be remembered for another reason. He was given the title, 'Master of Abdominal Landings,' for the three belly-landings he made in B-25s. Cornish acknowledged the rather dubious honour with humour. "The reason Her Majesty never looks me up when she visits is I buggered up so many of her aircraft," he told me with a chuckle during a 2014 interview for the museum's Blatchford Tales Oral History project. We have produced two segments from that interview, one dealing with his war years and one about Owen Cornish's post-war flying. Allinson's love affair with aircraft spanned decades. Following high school, Allison enlisted in the regular RCAF and trained as an Aircraft Maintenance Engineer. 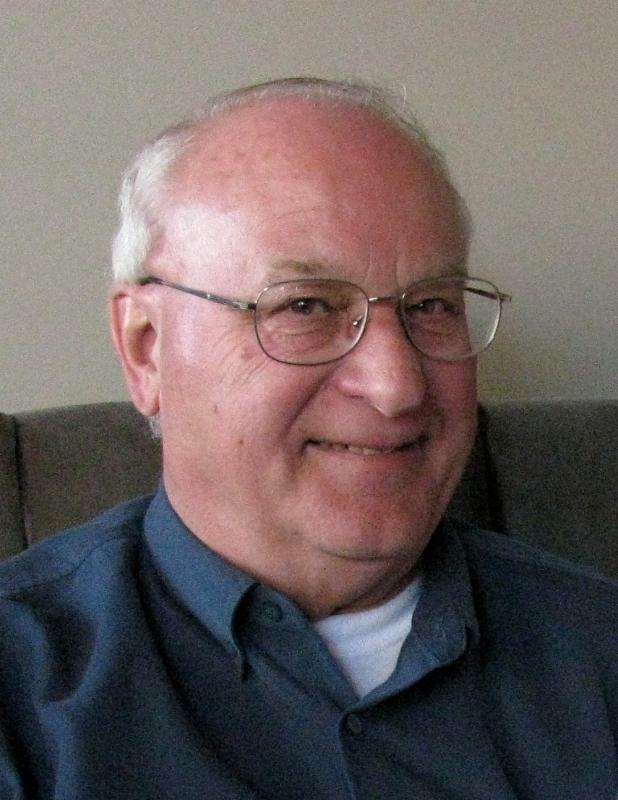 He went on to served for many years as Chief Engineer for the Edmonton Flying Club, and later as an accident investigation officer with the Transportation Safety Board, from which he retired as Superintendent of Technical Investigations, Western Division. “Tony was an ingenious, meticulous, clever and careful craftsman in everything he worked on,” says Chalmers. He was a long-time member of the Canadian Aviation Historical Society and a member of the Alberta Aviation Museum for almost the entire length of its existence. We extend our condolences to the many friends and family members of both men who played major roles in Edmonton's aviation history. January 19, 7 pm. Red Stars over Alberta: Lend-Lease Flights during WWII. Our AAM Lecture Series continues with historian Ken Tingley discussing the movement of more than 8,000 American war planes destined for the Russia. Members $8, non-members $10. More details here. February 16, 7 pm. Back to the Future: Airships Then and Now. Part of the AAM Lecture Series. Museum historian and In Formation editor Neil Taylor talks about the history of airships and the renewed interest in the massive flying machines. Members $8, non-members $10. More details here.